I don't quite know if I've decided how I feel about this one yet, so please bear with my stream-of-consciousness review. 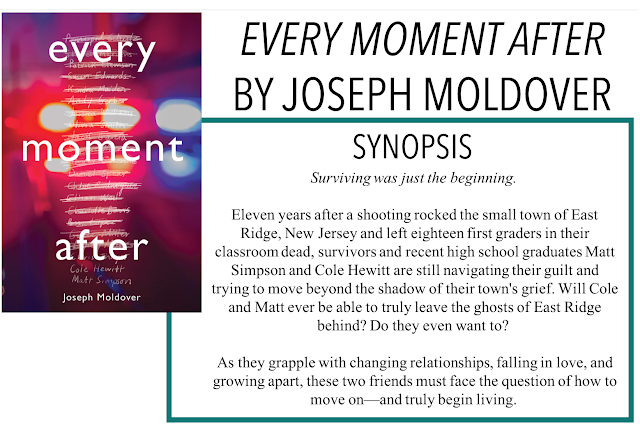 I am back with another review, Every Moment After by Joseph Moldover. Thanks so much to Raincoast Books for sending me an ARC of this book for an honest review, as always, all opinions are my own. This book follows the perspective of two characters, Cole and Matt. Both are graduating high school - eleven years after a gunman came into their grade one classroom and killed eighteen of their classmates. Dealing with the guilt of surviving as well as trying to figure out what to do with the rest of their lives, this coming of age story is about more than just the aftermath of a school shooting. Going into this book, I wasn't sure how graphic and immersive it was going to be. I was worried we would be put right into the middle of the shooting and I wasn't sure I had the emotional strength to handle that. Moldover, however, focuses on the later impacts. How the community reacts, who leaves and who stays, the long-term psychological impacts. Interestingly, there was a bit of discussion on gun laws and restrictive practices. While Moldover gives a voice to both sides, Cole, one of the children who was present for the shooting, seems to be on the stricter side of things, which is unsurprising given his trauma. I'm not going to get into it too much but I just thought it was also interesting how there was a depiction of the other side as well. While the shooting is the main focus of the background story, the central focus is about Cole and Matt. It's been a while since I've read a book from inside a teenaged boy's head but I think this was a really great coming of age story centred specifically around growing up as a boy. This book takes an honest look at male friendships and how critical they are to the boys' lives. There were a few things I didn't love about this book, but I think those flaws are part of the flawed life-story of Cole and Matt. Nothing, as they know, goes according to plan and while there were some things that I could have lived without, they added something else to the story.